An artist's workspace, created behind a grand terrace of Grade II listed Georgian townhouses. The 'light chimney' and dark timber cladding provide a dramatic endpoint to the garden, while integrating comfortably with the natural setting. Situated behind a grand terrace of Grade II listed Georgian townhouses, at the end of a long garden and hidden by mature planting, the Print Studio is both workspace and sanctuary for artist and longterm resident Susan Aldworth. Having rented studio space across Hackney for 25 years, Susan commissioned the Print Studio to create a permanent workspace for herself, free from the whims of rising rents and changing land-use. The Print Studio is a low-cost tailor-made solution to enable Susan to continue her lifework in an environment designed specifically for her needs. The design is based on a thorough understanding of Susan's working methods, processes and habits. Inside the studio, a long workbench running along one wall allows Susan to work through the printing process; from mixing colours, to inking her plates, preparing the paper, running the press and setting out the prints to dry. 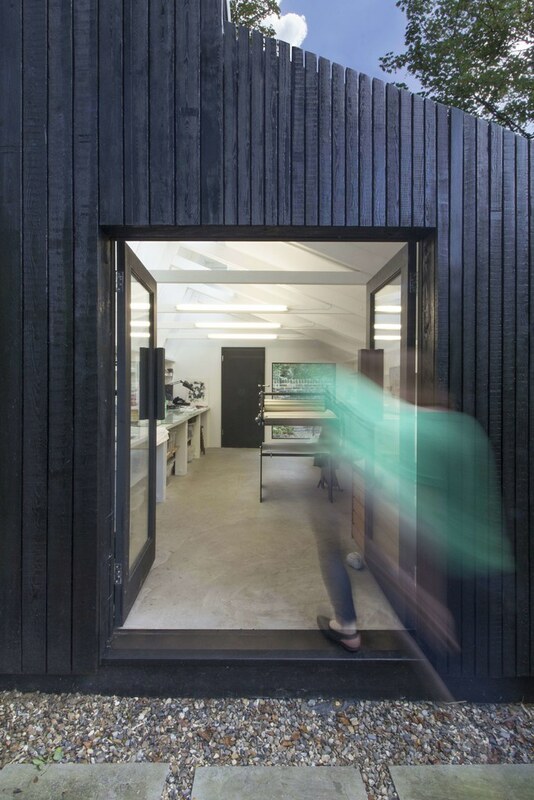 Above the workbench, a south-facing 'light chimney' harvests natural daylight which reflects off the interior walls, ensuring the space is illuminated with indirect light throughout the day. The studio itself is pulled back from the end boundary, a large picture window frames the view of this second 'secret garden' beyond the studio, creating a tranquil space for Susan to write, sketch, and plan her work. The 'light chimney' is the defining feature of the exterior form, creating a strong formal elevation which provides a dramatic end-point to the garden, while the dark timber cladding integrates comfortably with the natural setting. A lightweight construction method was employed to minimise material impact and keep build costs down. The construction comprises a simple timber frame, fully insulated with a durable, lightweight waterproof membrane. Our approach to sustainability means using good-quality long-life building materials that can be repaired and maintained as opposed to requiring periodic replacement.